Garth Brooks sang wise words when he sang, "Some of God's greatest gifts are unanswered prayers." Have you ever prayed and prayed and prayed only to hear God say NO? Or maybe you didn't hear NO you just experienced silence. This song has comforted me in some of my most desperate moments. Moments when I have cried out, begging God for the answer I wanted, but hearing NOthing. If you are in that place or have been in that place take a moment to listen to A. Peterson's words. You will be blessed, I promise. I acknowledge that the silence of God and NO are not the same thing. Personally, the silence hurts more. Then again, the NO's of my life have yet to be devastating. Or have they? They sure felt devastating at the time, but that is the beauty of God. 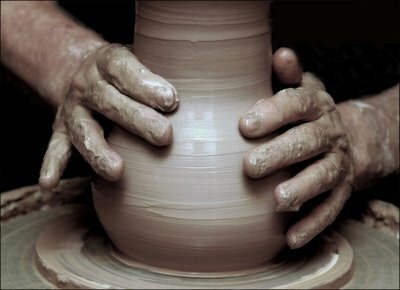 He takes devastation and just like a potter (Isaiah 64:8) He molds us, kneads us, stretches us, and spins us into all He wants us to be. It can be painful. It is painful, but it is good. As I continue to think about unanswered prayer I realize I could fill a book with the words of my heart and still convey very little to you, the reader. My thoughts and my words make sense to me, but it is my story. Each of us have a different story, but I know within that story is a time, a season of unanswered prayer and/or the silence of God. I will reserve this space for a short story about a time when God's NO ultimately was a YES!!! A yes to a life with Him. I had been in a relationship for about 2 years and like many teenagers, I thought I was head over heels in love (I'm not sure how breaking up a billion times during 2 years wasn't sign enough that I was not in love, but moving on). It was the summer before my sophomore year of college. We broke up (again), and I found out he had been cheating on me. I was devastated. I spent weeks crying and begging for our relationship to be restored. I begged God and I begged him. At that time, God lived in a pretty black bottle. I would pull him out when I was desperate, but otherwise I carried Him around in my pocket, occasionally rubbing the bottle, expecting Him to pop out and give me my 3 wishes. During this time I made horrible decisions trying to be noticed, trying to make him jealous, trying to win him back. To make a long story short, God said NO to my requests. His NO lead me to Fellowship of Christian Athletes. His NO lead me to a group of friends that continuously pointed me to a closer relationship with Him. His NO lead me to a Bible Study with a small group of women that prayed and encouraged me. His NO lead me to an intimate prayer life that became more about knowing Him and less about the answer I wanted. His NO lead to a life of desired holiness and transformation. His NO lead me to a man that has strong character and a desire to be a godly man, a godly husband, and a godly father. His NO lead me to a family that has encouraged me and opened my eyes to so many new experiences. His NO lead me to the cross!!! How has your journey of faith been influenced by God saying NO? Can you look back and see that God had a purpose when He answered your prayer with His silence or with NO? Will you share it with us today? If you decide to share...enter the URL to your post in the link tool below. If you join, please help us find one another by sharing the "Journey of Faith" graphic within your post. You can copy and paste the code below. I am praying that a few of you will link up, as I enjoy reading of God's work in your lives. Next Friday: Will you consider sharing one of the spiritual gifts God has given you and how have you used it? This is a time to glorify God by sharing of His work in your life, so I pray a few of you will join me this week. Thank you for sharing about your biggest unaswered prayer. It's funny I too prayed for another relationship to work back in high school, but ultimately God's no led me straight to Steve and being his wife today. God does have abundantly better plans than we could've ever imagined!! Also I'll mail you two tickets to the holiday gift market today since we're leaving for our trip tomorrow. hope you enjoy it and looking forward to seeing you when we get back! BTW, Your new header is cute and the colors are great! Very good post - theology and writting. Yes, God often says 'no' for our own good and spiritual development. Hard to understand at the time, esp when we are in inner conflict, emotional pain, etc. The song was good, too. Good post all around!